EXECUTIVE SUMMARY: The US was in the nation-building business for years, in Afghanistan, Iraq, and Libya. But on August 21, 2017, US President Donald Trump stated unequivocally, “We are not nation-building again. We are killing terrorists.” As he constructs policies towards Islamist terrorists in Afghanistan, as well as towards the rogue, nuclear-focused regimes in Iran and North Korea, Trump is drawing on the lessons of past follies. On September 27, 2017, during a visit to Kabul, US Defense Secretary James Mattis – having escaped being targeted by insurgents during the visit – was unambiguous about the challenges the US faces in Afghanistan. Those challenges are serious: the Taliban now controls 40% of Afghanistan and a third of its population. Much has changed since the successful 2001 war in Afghanistan, which was primarily conducted not by the US Army but by CIA operatives in rusty Russian helicopters, a handful of US Special Forces, and some Air Force units. On November 14, 2001, they and the indigenous, anti-Taliban, Northern Alliance crossed the Hindu Kush mountains to liberate capital Kabul. President George W. Bush deserves credit for both the quick victory and the forging of an alliance with Russian President Vladimir Putin against al-Qaeda and its Taliban enablers. However, Osama bin Laden, perpetrator of the 9/11 attacks, was not captured, and the war became an exercise in American-led nation building – a sustained political and economic international effort to transform a dictatorship into a democracy. Bush was unaware just how daunting that task would be. Afghanistan is less a nation than a quilt of warring ethnic groups, all of which had been savagely resistant to earlier foreign invaders, Britain and Russia. Bush did not grasp that the defeat of the largest ethnic group, the Pushtun-based Taliban, by the second major group, the Tajiks of the Northern Alliance, would change the country’s ethnic equilibrium. The Taliban eventually regrouped to resist the Tajik dominance in Kabul, the latter supported by the new invaders, the Americans. Meanwhile, the war in Afghanistan had interrupted Bush’s earlier planning for another war: that against Saddam Hussein’s Iraq. The president believed Saddam’s survival of the 1991 Gulf War had cost his father, George H.W. Bush, the 1992 presidential election, and the Iraqi dictator had also attempted to assassinate his father. As Bush’s biographer, Jean Edward Smith, demonstrated, the president held a Wilsonian belief that he was being divinely guided to bring democracy to Iraq. Following 9/11, Bush rallied US intelligence to find evidence either linking Saddam to al-Qaeda and 9/11, or showing him to be in possession of WMDs. Nine days after Kabul’s fall, with no such evidence found, Bush secretly ordered Defense Secretary Donald Rumsfeld to plan an invasion of Iraq. 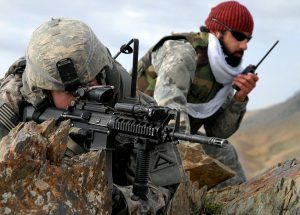 America’s quick victory in Afghanistan had encouraged Bush to believe Washington could simultaneously deploy forces in both Afghanistan and Iraq. A bitter awakening followed. Far from being “accomplished,” the Iraq mission had only just begun. Saddam was hunted down and hanged, but civil war exploded between Sunnis, Shiites, and Kurds. To make matters worse, fired military officers of Saddam’s de-Baathized army merged with al-Qaeda offshoots to create a new insurgency. Eventually ISIS was born. The Iraq insurgency also helped to cultivate a new form of terrorism in Afghanistan – suicide bombings – with instruction provided via social media by Iraqi jihadists. In response, Bush gradually boosted US Afghanistan forces from 21,000 to 31,000 troops in a “silent surge.” It was not enough. Iraq was draining resources from Afghanistan. In 2008, the new US president, Barack Obama, declared, “We have to win in Afghanistan!” By 2011, he had raised troop levels from 31,000 to a peak of 111,000. He also appointed General David Petraeus as Afghanistan’s commander-in-chief of allied forces. Meanwhile, Obama supported the “Arab Spring” and the forging of a democratic Middle East as being “on the right side of history.” When a wave of rebellion reached Libya, the president faced a decision on whether to act. Then-Secretary of State Hillary Clinton favored both Qaddafi’s overthrow and nation-building, and was seeking a justification for a NATO intervention. She found one: a massacre Qaddafi was said to be planning in Benghazi. She described it as a “humanitarian catastrophe, with untold thousands at risk of being killed,” and urged, “we have to act fast.” She then got the Russians to acquiesce to a UN resolution to intervene for “humanitarian” reasons. Gates objected to the intervention. In his view, Libya’s civil war did not threaten America’s vital national interests. Gates did not believe the US “ought to take on another war” because “the last thing America needed was another enterprise in nation-building.” Naturally, the war in Libya only further weakened the cause in the other two wars in which the US was engaged. A 2016 UK Parliament report, Libya: Examination of intervention and collapse and the UK’s future policy options, concluded that “the threat to civilians was overstated” and that “the [US-armed] rebels included a significant Islamist element.” Condemning the UK role in the intervention as having been based on lies, it blamed the NATO bombing itself for plunging Libya into humanitarian disaster. Hillary Clinton – the main advocate of the NATO bombing – had not wanted to negotiate with Qaddafi at all. This was unfortunate, as Qaddafi had given up his own WMDs and was working with the US against the jihadists. He was also open to a peace deal overseen by General Wesley Clark and likely to have allowed peaceful regime change. After Qaddafi’s murder by US-armed rebels, Libya became a jihadist paradise, setting off a huge migration of war-ravaged Libyan Muslims to Europe. With the 2012 elections approaching, Obama sought to fulfill his promise to bring the troops home. Having earlier withdrawn all troops from Iraq, he began a gradual withdrawal of 10,000 troops from Afghanistan prior to the political conventions. Defense Secretary James Mattis has since asserted that Obama’s actions to fulfill that political promise “emboldened” the Taliban. “Presidents do not consider the cost of wars,” claims Robert Gates. They should. The overall costs of the Iraq war have been calculated at $2-$4 trillion, contributing to the recession of 2008. The cost in lives has been 4,488 American troops and about 190,000 Iraqis. One must also consider the tens of thousands of US servicemen and women who have returned home wounded and with long-term health problems. Afghanistan’s costs have been calculated so far at more than $1.07 trillion, with 2,350 US troops dead and 20,092 injured. US war efforts in Libya were mainly in support of costly NATO bombings. There were no US casualties, but the cost to the DOD was over $1 billion, according to Gates. Moreover, hundreds of thousands of Libyans became homeless and required humanitarian assistance. The rebels also massacred thousands of Qaddafi loyalists. In her book, Democracy, Condoleeza Rice expressed her conviction that the wars in Afghanistan and Iraq were nevertheless worth it. “A stable Middle East will one day have to be a democratic Middle East,” she wrote, and “[d]emocratic institutions are the best hope for humankind – including for the Middle East.” This sounds wonderful in theory, but Gates, her close friend, views the region differently. “The absence of democratic institutions, the rule of law, and civil society in virtually all Arab states…do not provide much reason for optimism,” he wrote in Duty. The official British reports and new scholarly research on US decision-making in Iraq and Libya strongly point to arrogance, ignorance, and even lies that brought the Americans into the wrong wars and then into costly nation-building. Unfortunately, neither the US Congress nor President Trump has yet conducted any serious official inquiries, as the British have done. Trump should correct this lapse and forge a bipartisan commission on the Middle East. Trump’s administration, as it attempts to forge a limited partnership of sorts with Russia in Syria, must carefully review the Kremlin’s present role in Afghanistan. Is Putin now arming the Taliban? Can the US eventually renew its anti-terrorist partnership with Russia? The US will have to keep a limited force in Afghanistan for decades to come – but Trump has delegated military strategy to three outstanding veterans of the Iraq and Afghanistan wars. This wise move provides reason for hope that henceforth, American military decisions will no longer be based on half-baked evidence or lies in the pursuit of self-interest. Above all, Trump must cope with a critical issue neglected by his three predecessors: Pyongyang’s and Tehran’s nuclear ambitions, the two most dangerous rogue states. Both have been emboldened by years of neglect and appeasement, and American attention has been deflected by unnecessary wars with much less dangerous rogue regimes in Iraq and Libya. Trump’s decertification last week of the 2015 Joint Comprehensive Plan of Action (JCPoA) is the first step towards linking Iran’s growing geopolitical threat to the Middle East with a curbing of its nuclear ambitions. The threat posed by North Korea to vital American national interests is also being taken very seriously by Trump, as suggested by the US military buildup around the Korean peninsula as well as tough new sanctions. Meanwhile, democratic nation-building will largely be at home. Dr. Jiri Valenta and his wife, Leni, are the principals of The Institute of Post Communist Studies and Terrorism (jvlv.net). A long-standing member of the Council on Foreign Relations, Jiri served for a decade as a professor and coordinator of Soviet and East European Studies at the US Naval Post-Graduate School and was a consultant to senior members of the Reagan administration. He is the author of Soviet Intervention in Czechoslovakia 1968: Anatomy of a Decision (Johns Hopkins Press). The Valentas recently published Washington and Moscow: Confrontation or Cooperation? at the BESA Center.